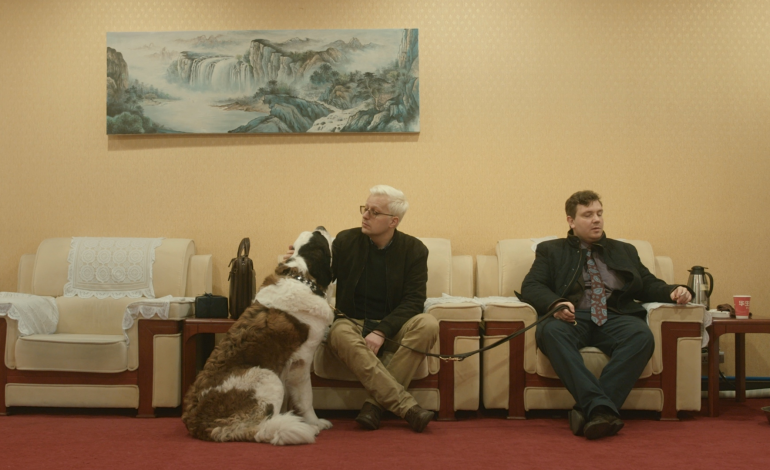 Two Danes and a Saint Bernard travel to China… that sounds like the beginning to a bad joke. And in a way, it kind of is. The Saint Bernard Syndicate tells the two story of two clueless would-be entrepreneurs who travel to china with a scheme to sell Saint Bernards as luxury dogs to the middle class. It’s a quirky premise with plenty of potential that gets traded in for utter inanity in a film that goes so entirely off the rails, I don’t know whether to be disappointed or impressed. The Saint Bernard Syndicate is the first narrative feature from the boundary-pushing documentarian Mads Brügger, whose last directorial effort was the incendiary documentary, The Ambassador, a farcical political documentary about diamond smuggling in Africa. This time, Brügger sets his sights on China. Frederik Cilius Jørgensen stars as Frederik, an unsuccessful businessman, looking to start a venture selling Saint Bernard puppies in China. In order to kick-start the operation, he reaches out to a former schoolmate named Rasmus, played by Rasmus Bruun. Though initially hesitant, Rasmus, who was recently diagnosed with ALS, sees the opportunity as an adventure and agrees to fund the operation. Frederik steals his father’s Saint Bernard, Dollar, and the two head to China to make their millions. Brügger is attempting to juggle a cutting economic satire, a buddy comedy, and an absurdist farce, but it doesn’t take long before elements start falling to the ground. Once it becomes clear that Frederik and Rasmus have no clue what they are doing, the film stalls. Frederik is ill equipped to attract investors, and Rasmus is more interested in hitting on one of their employees (Boyang Li) than with the business itself. The two play well of each other – the most successful sequence in the film involves the two debating who looks more like the boss – but for a ‘buddy comedy’, the spend a surprising amount of time apart. This leaves the film idling with no real conflict escalation for much of its second act. The film’s third act involves the two men getting defrauded by a would-be investor, but by then the plot has taken a backseat to what could generously be described as ‘a collection of scenes’. It seems that Brügger struggles with narrative when not constrained by reality. What remains is certainly interesting, but once you start asking yourself – what am I watching? it doesn’t take long to ask – why am I watching. The Saint Bernard Syndicate is a fun idea that runs out of gas too quickly. Brügger’s documentaries are taught and cutting; this feels meandering and overlong. Jørgensen and Bruun are wonderfully unlikeable idiots, but they’re not given the tools to get us really invested in their adventure. The Saint Bernard Syndicate is a film that sometimes the truth is crazier than fiction. Unfortunately we got the fiction.